Size M: Back Length(cm/inch):28/11\" Chest(cm/inch):36/14.1\" Neck(cm/inch):24/9.4\" The sizes are for small dogs/cats and run small, please measure dog\'s size ensure whether fit it before you order. 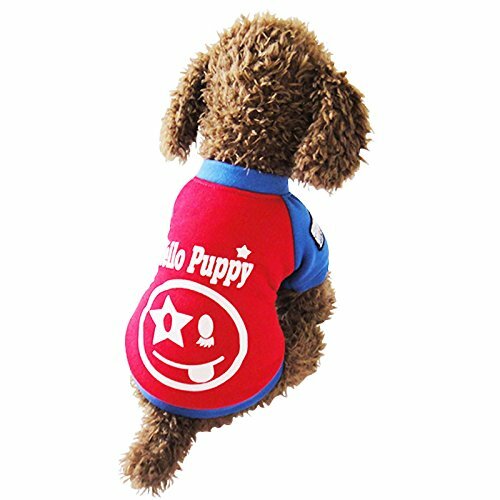 Made of high-quality soft cotton,keep your dog feel comfortable all the day. Any occasion suitable for Cat,Chihuahua,Minature Doberman,Yorkshine Terrier to wear, make your pet become more attractive and dynamic in crowd. Keeps your pet warm and cozy throughout any outdoor activity. Assured to bring smiles to the faces of your loved ones with loads of love for your pet.